Heading into 2019 with a desire to transform your home? Perhaps you’re finding your current space a little dated. Maybe too cramped? Not enough light? If that’s the case, you might be wondering how other homeowners have used modern trends to shape their favourite spaces. One of the biggest themes in modern design is the desire to bring better connection between the outside and inside spaces. For this reason, bi-fold doors have taken really taken off in recent years. These constantina additions not only offer full glazed walls without the need for structural glass, their unique way of unfurling gives homeowners the chance to open up the entire rear of their home. In this design, envisioned by Resi designers, we’ve taken the bi-fold door one step further and included a floating corner. These allows for the doors to open up even further, helping to give this London townhouse an illusion of more space in their kitchen and living area. However, homeowners considering this option should be aware that complicated structural elements such as this do come with a higher price tag, as they’ll require special consideration from a structural engineer. Because times are changing, homes are no longer forced to choose between bricks when it comes to building an extension. Industrial style metals are on the rise, especially when it comes to more traditional households. Many Resi customers have chosen to blend the modern with the historical, mixing steel or iron, with classic stock brick. In the example above, our designers envisioned not only a blend or metal and brick, but also included a large glazed addition to house the spiral staircase inside. When planning out your extension, why not consider what blend of materials you could make? Think contemporary design is nothing but clinical steel? Think again! The homeowners of the above property did a wonderful job of using the brightness their extension brought in to help contrast their bold colour choices. We flooded this property with natural light by having large, glazed doors open out onto a landscaped patio area, and then added in several skylights for good measure. With so much brightness, this home’s quirky use of colour really pops next to the white surfaces. By far our favourite finishing touch has to be the rainbow staircase. After all, colour isn’t just for children! This last extension accomplishes many things. Not only does it blend wood, iron, and brick together, it even includes a pop of colour - thanks to their well chosen storage shed. But what this design also showcases is that great contemporary design can even be achieved with strict planning restrictions. 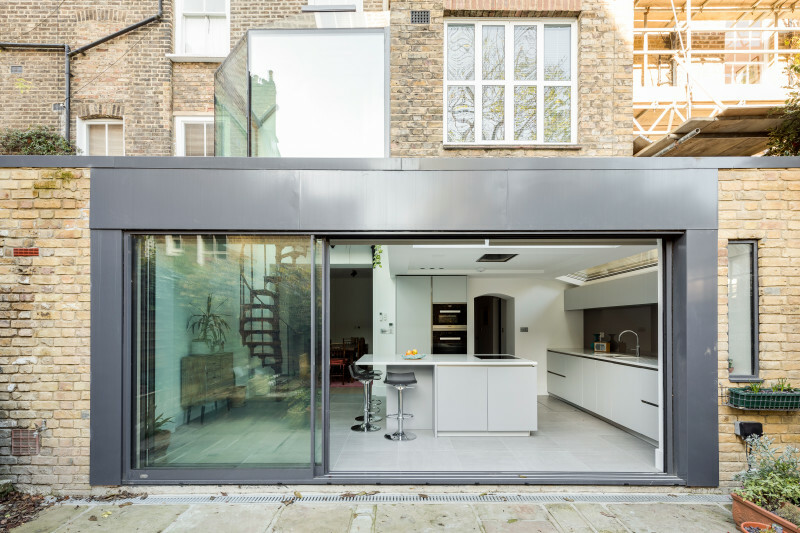 The staggering of this extension was added to prevent any overshadowing to the neighbouring properties. This is a common when seeking planning permission for a home in a densely packed area, such as London. Rather than falter at the challenge, our designers used this to their advantage to create different levels to the extension. This allows for the inside to separate into kitchen and a small living area, and has even generated a small reading nook. This just goes to show that modern design is also clever design. Still looking for inspiration? Make sure you check out the rest of our portfolio.